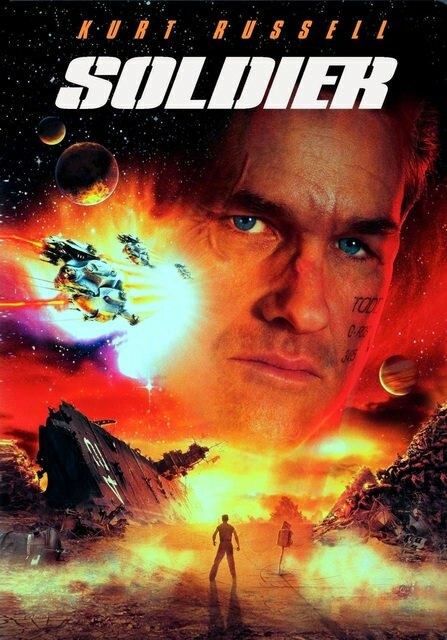 Kurt Russell gave the best performance of his career in this very unappreciated film. It never fails to impress me, no matter how often I see it. The movie didn't do well at the box office — just another example of a great movie being ignored by movie audiences. The cast is magnificent, and the plot doesn't have a dull moment from start to finish. Jason Scott Lee does just fine as the latest model in a group of genetically engineered super-soldiers, and Kurt is the obsolete version that gets dumped with the garbage on an alien planet where a ragged little colony of peaceful folks are trying to eek out a living. When the colonists are chosen to be used for target practice by the ruthless handlers of the singled-minded super-soldiers, it's Kurt to the rescue, and things don't slow down until the closing credits start rolling. If you haven't seen this, you're in for a treat. If you still haven't seen this movie, you're guilty of dereliction of duty, private, and subject to court martial by your superiors! The training film at the link below is designed to resemble a fan-made trailer to fool the enemy if it ever falls into the wrong hands. It's required viewing. And yes, there will be a quiz. Now, begin your indoctrination, soldier. Eyes front . . . and look sharp! I'm not really sure this movie is all that good. Frankly, I remember some of it as being pretty darn dumb. But...I absolutely agree with you about Kurt Russell. He's absolutely tremendous in a role which wouldn't seem to offer that much opportunity for thespic greatness. I can still hear him in my head saying, "I'm going to kill them all." Brrrrr. Great. Is it the greatest performance of his career? Mmmm, that I'm not so sure about. He's a terrific actor and has served up lotsa good stuff. It might be his best....it might not. Doesn't matter much, though, 'cause it's still Great. I meet Kurt accidentally at the 1962 Seattle Worlds Fair — Century 21 Exposition and we have communicated ever since. At the time when they were making Soldier he said it was his take on an old soldier from the Starship Troopers (1959) novel. "You spend a life-time as a soldier 'killing the enemy' it's hard to break that habit, ya know?" I LOVED this movie! I was highly impressed by Kurt's character as well as Sean Pertwee's performance! Very highly recommended for the military Sci-Fi fan! I'd love to watch it with you sometime in All Sci-Fi's Chatzy room. Just pick a day! IMDB has 42 trivia items for this movie. Here’s a few of the ones I found the most interesting, in the blue text. ~ Kurt Russell's son Wyatt plays him as an eleven year old. Note from me: I've always been impressed with the little guy who played young Kurt. ~ Writer David Webb Peoples has said that Soldier is a "side-quel" to Blade Runner (1982) (which he also wrote) because it takes place in the same universe, and in fact the vehicles used by the Blade Runners - spinners - are also used in Soldier. The premise of Soldier was actually based on an unused opening scene for Blade Runner, where a group of Replicants are dumped and left for dead on an Off-world colony. Both films were released by Warner Brothers, and both were box-office failures that gained a cult following after being released on home video. Note from me: Cool! And this next item relates to the one above. ~ David Webb Peoples started writing the screenplay to Soldier while Blade Runner was being filmed. As the screenwriter of both films, he has long maintained that they are set in the same universe. Director Paul Anderson agrees, and says that if Kurt Russell's character were to go to Earth, he would have encountered Harrison Ford's Deckard. Note from me: This next item "sort of" supports the two above because of presence of the Blade Runner prop. ~ Among the garbage on the planet is the U.S.S. Franklin Delano Roosevelt, the F-117X Remora from Executive Decision (1996), a spinner from Blade Runner (1982), and a piece of the Lewis & Clark from Event Horizon (1997). Note from me: The "garbage dump" planet always struck me as an unrealistic idea. The wastefulness of transporting all that material to a distant planet instead of recycle it just doesn't make sense. ~ Todd, the main character of this movie, is on-screen over 85 percent of the time, but only speaks a total of 104 words. Note from me: The amazing thing about Kurt's performance is how powerful it is without much dialog and almost no facial expression. He should have been nominated for an Oscar. ~ According to Paul W.S. Anderson, Kurt Russell worked out three or four hours a day for eighteen months to get himself into the "pumped-up" condition he displays in this film. Anderson says the making of "Soldier" was actually postponed to allow Russell to do this, because Russell thought it was so important to Sergeant Todd's character; Anderson made Event Horizon (1997) in the interim, while Russell made no other movies during that time. Note from me: It saddens me to think about how disappointing the box office was after so much work, talent, and imagination were put into it.